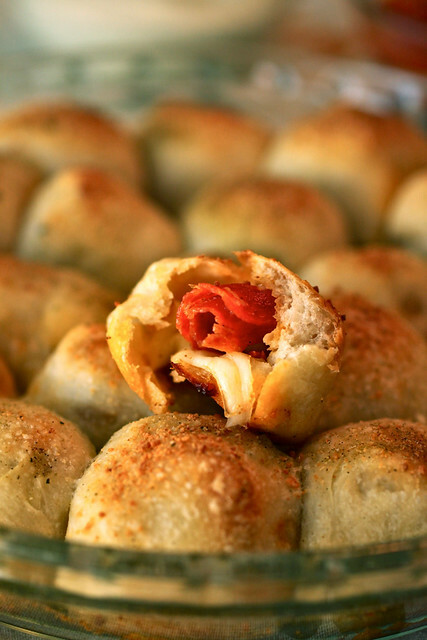 What a better way to start the new year than with some pepperoni pizza bites? Look, when there’s bread and cheese involved, diets be damned! Actually, I made sure I made these bites before the annual resolution kicked in today so as to avoid any guilt. And boy were they worth every bit of anticipation I had about them since Annie posted about them almost a year ago. Seriously, they were amazing – so good that I’m ashamed to admit that Kyle and I polished off the whole batch by ourselves on NYE. You could fill them with practically anything but the process is simple: cut pizza dough into 20-24 pieces, press some mozzarella cheese and pepperoni (or turkey pepperoni, or cooked ground sausage, etc.) into the dough, and wrap the dough around the filling. You’ll bake them for 20 minutes and then watch them get devoured. I can’t see these lasting very long at any party so go ahead and double the recipe – your friends will thank you. What a fun appetizer. I will have to try these out. 😉 An excellent treat to sneak in before the healthy eating resolution kicks in. We’re playing cards with friends on Wednesday nite and I can hardly wait to take these to share. I just know they’ll be a huge hit. I seriously am not sure what better way…still thinking…. These are definitely the perfect appetizer. One or two bites and no mess but I’m sure they’re packed with flavor. I am obsessed with these and would love to make them, except I think I’d eat the entire batch myself! I made these this weekend. I used string cheese and cut them into about four pieces per “stick”. It worked great. They were super delicious!! Mmmmmmmmm, what a great idea. Great idea. I’m bookmarking this! These sound dangerous! I could probably eat the entire dish full of them. Great photos too! These look so delicious. I love them! those definitely look better than the frozen kind… and those are amazing! love it! 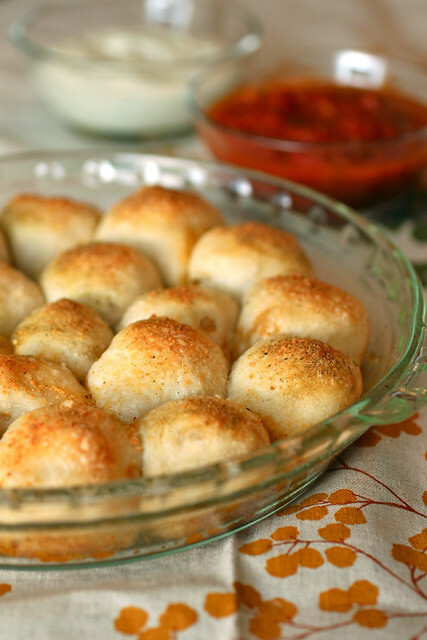 I love love LOVE this recipe…I was actually just planning on making it for my sister-in-law’s baby shower this weekend (the theme is mini-food so I thought pizza ‘bites’ as opposed to full pizzas made sense). Great job. You know, I never bothered to make pizza before because just thinking of handling the dough makes me tired. But pizza bites! Roll ’em into a ball and you’re done! Great idea! 🙂 I might even sleep early just to wake up early to make these. Yeah, I’m totally with you on eating a whole pan at once. The first time I made them, I made two pans for four of us (Ben, me, and two friends) and we ate every single one. YAY pizza bites! Made it, loved it, blogged about it. You rock! Thanks for the great recipe. Mmm, this was the bomb! Really we all loved it! I agree with other posters, it is easy to eat too many of these because they look small and cute and burst with flavor – before you know it, the pans are empty! Yikes! This definitely is a recipe that we will be having often! We had these last night at our New Year’s Eve party! A total hit. I made a quick garlic-infused olive oil for the top (with some red pepper flakes and oregano) for another flavor note. Really good. I can’t wait to try some of your other best of 2011 recipes. Hi Lauren! These are crazy easy and you could even use store-bought pizza dough (the bagged ones from the local pizza places) if you don’t want to make your own pizza dough. Let me know how they turn out! The sauce is on the side for dipping.